12 Hours of the Best of Dr. Douglas Graham and Prof. Rozalind Graham. Welcome to a whole new experience of eating that can transform your relationship with food, and your body, into one of health-filled bliss. In twelve inspiring lessons you will learn how to nurture your body with the very best nutrition while freeing yourself form the shackles of unhealthy food cravings. As you apply principles learnt, each meal will become a peace-filled delight that results in a superior health and well-being. The simple truths that you will discover on this course are matched by the beautiful simplicity of their application. The information provided by this course will enable you to create the eating habits of your dreams; less time spent preparing for, and cleaning up after, meals and more time to enjoy vibrant health. Lesson 1 explains the vital role of carbohydrates in your diet and clearly shows you how to differentiate between those that are your friends and those that will steal your peace and your health. Guidelines are provided enabling you to identify your daily requirement of this nutrient and how to best obtain it. In Lesson 2 you will learn all you need to know about fats in your diet. Complex scientific facts are translated into simple, understandable language leaving you in no doubt as to the appropriate type and amounts of fats needed for the creation of superlative health. Protein is the topic of Lesson 3. By the end of this lesson you will have accessed vital information about the role and healthful consumption of this much-misunderstood nutrient. Armed with the facts, you never need worry about where you get your protein from or if you are getting enough. Once lessons one to three have been completed, you are ready to move on to Lesson 4 and discover some of the most vital nutritional education that has ever been offered. The effects of applying heat to food are explained in captivating detail along with the key facts about many commonly eaten unhealthy foods. In this lesson you will find out just how simple the issue of food combing really is and how to assure your meals are always digestible. Lessons 5 and 6 provide you with the groundbreaking, and habit breaking, facts about food addictions and cravings. Here you will discover what causes such a distressing relationship with food and how to free yourself from the clutches of compulsive eating once and for all. Slenderness the Natural and Easy Way and peaceful eating are the topics of Lessons 7 and 8. Here, the causes and consequences of overeating are further explained in great detail. Effective tools and strategies for the creation and maintenance of a healthy body composition and a relaxed relationship with food are clearly and specifically set out. In Lesson 9, you will learn how to invest minimal time and effort in designing your meals while at the same time creating vast amounts of robust energy for yourself. It is in this lesson that you will find some delicious and simply creative recipe ideas that save you time and preserve your energy. The subject of how to share your knowledge with others is the focus of Lesson 10. Topics such as family feeding, creating harmonious mealtimes, making friends while influencing their diets and how to impress your mealtime guests are all included. In this part of the course you will also learn how to set up your kitchen in such a way that it maximally supports your new eating habits. Lesson 11 provides you with the education and necessary practical and psychological tools to set appropriate goals for yourself and achieve them with ease and confidence. The course concludes with Lesson 12, which covers the vital topics of energy, intention resolve and pitfall avoidance. 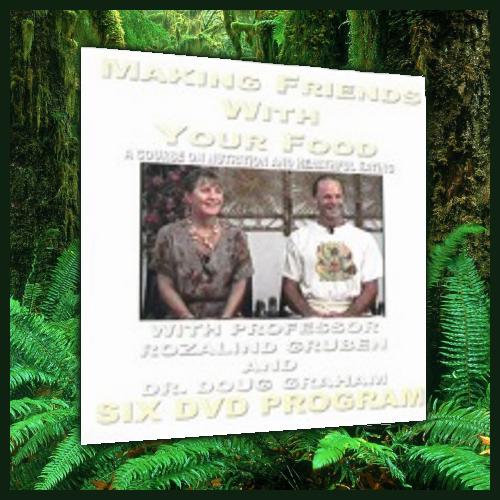 Once you have studied this final lesson you will be ready to set about truly befriending your foods, nurturing your body and experiencing the relationship with food that you have always wanted.